Voters head to the polls. Markets are pricing in greater political risk headed into this week’s election. Looking beyond the market action, however, we see encouraging fundamental signs. Employment gains, steady job growth, stable demand, and a return to earnings growth all speak to a better backdrop for stocks. Domestic economic growth should be near our 2-3% range in the second half, marking a clear turnaround from the pattern of weakening growth through 2015 to the first half of 2016. It is even likely that business investment is picking up, now that the ill effects of a strong dollar and sliding energy prices are fading. Still, uncertainty over the election is impacting risk appetite. Although we won’t know the outcome of the election for a few more days, markets have begun to contemplate what change at the top might mean. The candidates differ on taxation and spending policies, but the details are far from clear. Moreover, there is little doubt that moving either candidate’s agenda through the legislature will be an uphill battle. Not only will congress likely remain divided, but divisions within each party are also apparent. Ultimately, whoever becomes the next Commander in Chief will have an impact in shaping the next chapter in American history. Trade policy, regulation, energy, foreign policy, and appointments in the courts and the Federal Reserve (Fed) are all important and will carry long-term implications. For now, however, knee-jerk market reactions to a change in administration will largely be a function of conjecture and clouded expectations, rather than tangible policy changes. Thus, any such market moves should be taken with a grain of salt. Short-Term View A Clinton win likely is the case most priced into markets given polling data. Stronger currencies for trading partners, including Mexico and Canada, is likely in the cards under a Clinton win. Markets, preferring knowns over unknowns, may also unwind some of the risk premia built in in recent weeks under a Clinton win. Equities could stage a rally and bonds could give up some ground, pushing Treasury yields moderately higher, and tightening credit spreads. A Trump win might have the opposite effect. Since polling indicates this to be the less likely outcome, we might expect a Trump win to put some short-run pressure on risk assets given the greater uncertainty over Trump’s proposals. 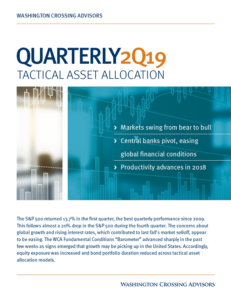 A less known quantity in Washington, a Trump win would introduce some uncertainty into the outlook, likely requiring at least a short-run bump up in risk premia. Regardless of who wins, the passing of the election (and hopefully it passes uncontested) should allow for political uncertainty to subside. If the din of politics fades a bit, perhaps it will then become possible for markets to focus on some of the more constructive trends in fundamentals seen in recent weeks. Since our focus tends to be of the longer-term variety, we are reminded that fundamentals tend to win over politics. 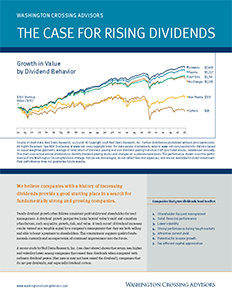 Growth in the economy and corporate earnings, over time, are key to long-run equity returns. Monetary and fiscal policy, along with regulation, trade, and rule of law are also important. Still, we are humbled by the decades of past administrations (graph, below) who have presided over a wide array of conditions. War, peace, growth, stagnation, inflation, deflation, social tranquility, and strife were all experienced since the end of World War II. While the sample size is not large enough to provide a robust answer to which party is best for the markets, it is clear that both parties held the White House during periods of both prosperity and stagnation. History has shown that betting on markets based only politics can be a costly and difficult proposition. Ultimately fundamentals, not politics, determines the direction of the economy and markets. This is why a focus on fundamentals is at the core of the WCA investment discipline.